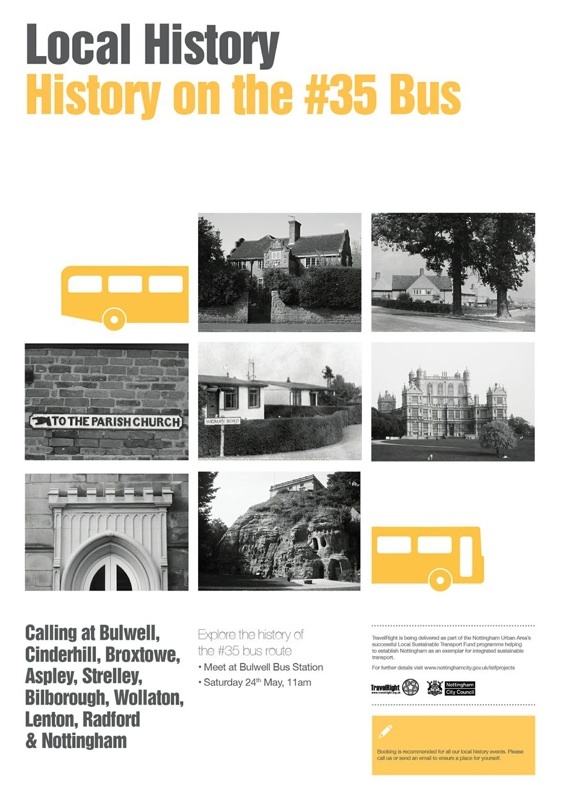 History by Nottingham Bus and Tram | A one-stop website promoting heritage related locations you can reach on a Nottingham bus or tram. Short notice I know, but there are problems with this website which I am unable to address until after my wife and I have moved (it’s a long ongoing saga beyond our control). The bus is now close to being full, but there will be last minute cancellations I am sure. My wife and I are in the process of moving house and it has been a pre-occupation since mid-June and it will continue to be until mid-September, since I need to re-think how the website operates. For several weeks now the website has been receiving hundreds of spam emails daily and several attempts to overcome the problem have failed and we simply do not have the time to sort it out until after we have moved, so please bear with me. This is the cover of a new leaflet by Nottingham City Transport. It is very good and shows what can be achieved when you have the necessary financial resources. There are also 32 ‘exclusive discounts’ advertised, which you can take advantage of on presentation of a valid GroupRider ticket. Having argued for a good few years that NCT should be doing something like this, I am going to save any criticisms I might have until they publish their 2015 edition. I make no claims that historybybus.org.uk is original, other than the fact that it is the first website in Nottinghamshire to bring history and buses together in a systematic way. 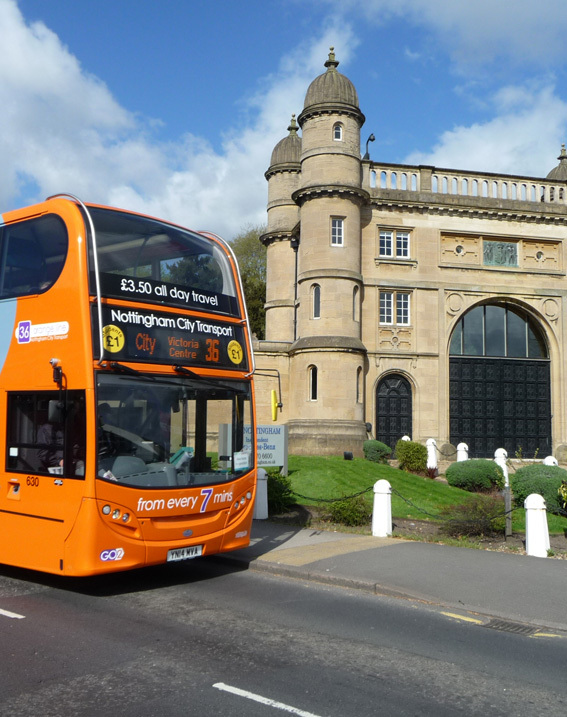 You can pick up a copy of the NCT leaflet from the NCT Travel Centre, South Parade, Old Market Square, Nottingham, or down load online pdf files here: Nottingham-wide Map; City Centre Map; List of attractions and linking bus routes and the exclusive discounts list. It’s ten days since the 35 History Bus ride came and went, and being the person leading the event (nominally), I had no time to take any photographs, so the few I have here are all courtesy of Nottingham City Transport. The bus was a sell-out, but a few did not turn up. I suspect the miserable weather put them off. It rained all the time, yet nearly everyone got off the bus and followed me on a short work through Bilborough village. That was impressive. Then at the end of the journey, we met others in Angel Row Local Studies Library and were treated to mix of food and a lesson of sorts in Old English. There were two Old English speakers on the bus, Paul Cavill downstairs and Geoffrey Littlejohns upstairs announcing place-names in Old English. From the feedback, everyone seemed to enjoy the experience. We also had the TravelRight history and walk Guide to the 35 bus hot off the presses and I lost count of how many faces I saw buried deep into copies of the Guide. Local historian and graphic designer Chris Matthews took my maps and text and re-created them in TravelRight’s house-style and Juliet Line edited the text so that it could be fitted into the space available. Thank you to both of them. John Parker, the Chair of Nottinghamshire Local History Association (NLHA) was waiting for us at the Library with displays and information. It really was a team effort, so a big thank you to all involved. 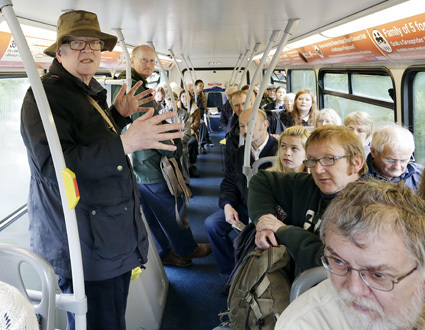 People board the first of what will be a fleet of refurbished double-deckers for the 35 bus route this summer. 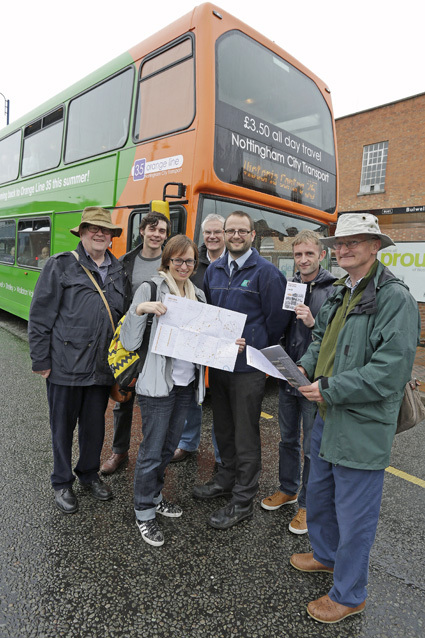 These are the folk who made it happen for me, from left to right: me; Andy from RideWise; Juliet from TravelRight; Paul from Nottingham University; Paul from Nottingham City Transport; Chris, who designed the leaflet, and Geoffrey from English Companions. 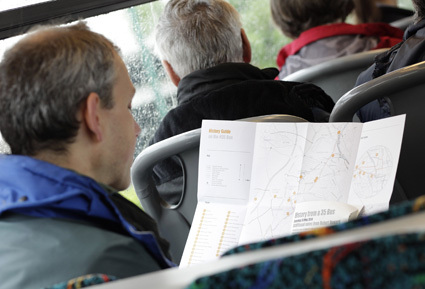 A passenger looking at the leaflet map. Such was the awfulness of the weather that the windows steamed up. We had four stopping points along the route, when I dashed up and down the stairs and repeated myself twice. Seeing myself in this rain hat I am reminded of a walk I did for Radio Nottingham around Lenton a few years ago. It rained then and I wore the same hat. Not pretty, but it keeps my head dry! Finally, an apology for not being as up-to-date with things on the website as I would like, but since October last year, when we finally decided to downsize for our old age, my wife Susan and been locked into the process of preparing our house in Lenton for sale, then trying to sell it, then when we did sell it, trying to find somewhere to buy. Inevitably, there have been hiccups along the way, but we have found a house in Beeston and we spent the weekend filling in endless forms — all very different to 1979, the last time we did it. In the midst of all this I was seventy a couple of weeks ago and I had a very enjoyable week of lunches with family and friends. Realistically, getting historybybus.org.uk up to speed is going to take me a little longer than I originally envisaged, so please bear with me. 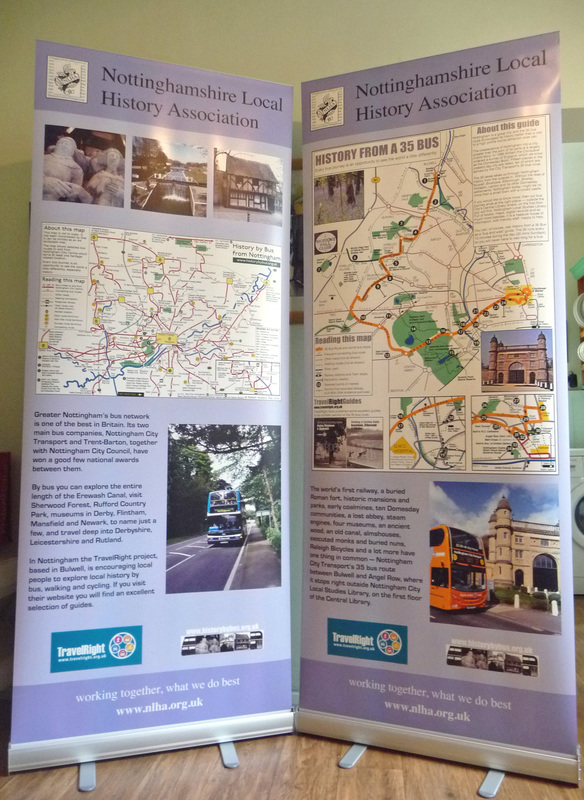 History By Bus is going to the Nottinghamshire Local History Fair in Mansfield Library this coming Sunday (11 May) as part of Nottinghamshire Local History Association, for whom I organise the Angel Row History Forum. They have kindly paid for two banners to be made, so come along if you can and see them close up. It’s always a great day with lots going on. For a good few years now I have been posting occasional walks to my parkviews blog. They are almost exclusively walks in and around Nottingham. Here are links to my two most recent walks, one with TravelRight around Aspley and Cinderhill on Saturday 12 April and my Good friday walk along an abandoned section of the Nottingham Canal. Nottingham City Transport’s 35 bus is going double-deck again sometime this year. This photograph I took on Easter Saturday at the Brindley Road stop on Birchover Road in Bilborough demonstrates why. 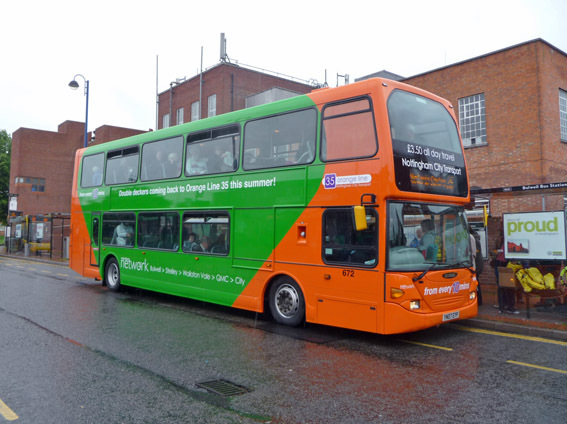 The occasional double-decker does already operate on the 35, but on 24 May 2014 there will be at least one double-deck 35 — the TravelRight 35 ‘History Bus Special’, leaving Bulwell Bus Station at 11.27am. To catch it you will need to pre-book with TravelRight to get your free ticket. I am going to do my best to make it a memorable journey for all concerned, with some very special surprises. I have long argued that the 35 is Nottingham’s ‘Heritage Bus Route’ and Saturday 24 May is my chance, thanks to TravelRight, to prove my claim. Please come along if you can, but book soon. The last I heard, the tickets were going fast! Over the next couple of days I will be posting the Easter Saturday walk around Bilborough and Strelley with TravelRight and their History Walks Leader, Chris Matthews, so please come back in a few days. Everyone travelling to and from Nottingham via the Derby Road goes past Lenton Lodge. It is one of the city’s historic landmarks. Certainly the grandest. The bus stop is known as Hillside. I took this photograph some years ago, before it was ‘commercialised’ with signage and its frontage became a car park. The Lodge was built in the early-1800s in the style of Wollaton Hall, when the then Nottingham Canal became the estate’s eastern boundary. After Wollaton Hall Estate was bought by the City Council in 1924, some of the surrounding land as sold off to help pay for its purchase. 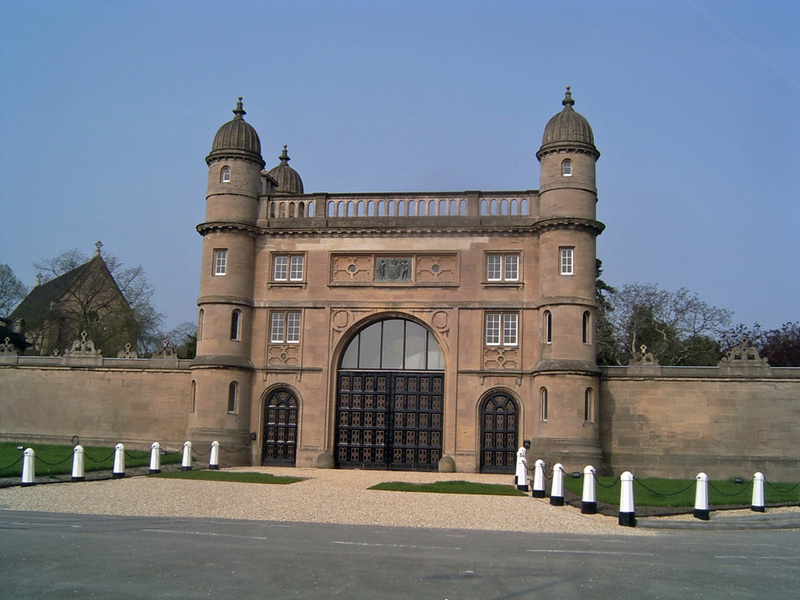 As a result, the gatehouse has become detached from what is now Wollaton Hall Park. 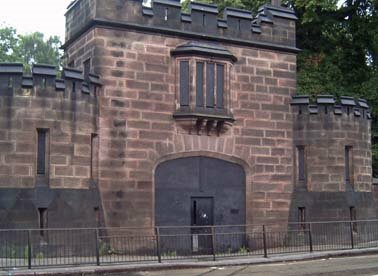 The Derby Road was the Estate’s southern boundary and there is another gatehouse on the Derby Road called Beeston Lodge (see below), about one mile west of this point, which is known as Hillside. The photograph above shows a Nottingham City Transport 35 picking up passengers as it heads towards the City Centre. The route used to be operated by double-deckers, but was made single-deck some years ago. 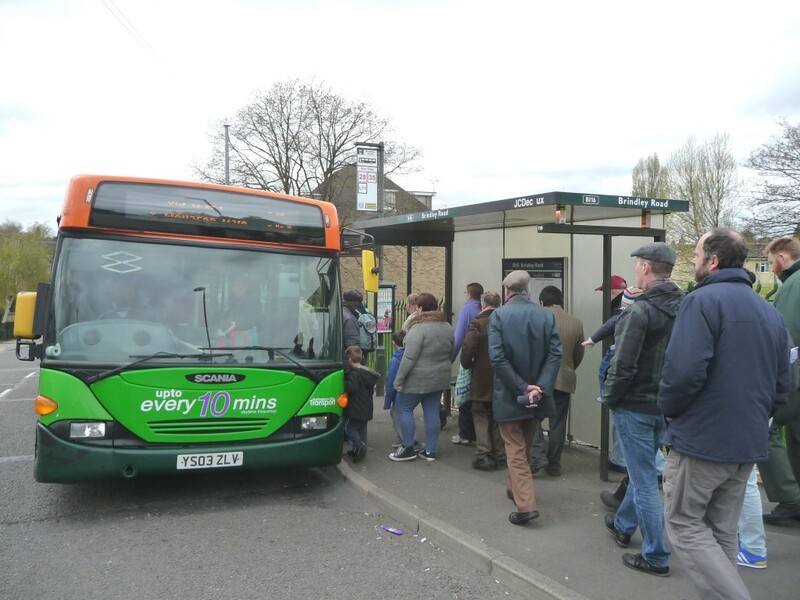 The good news is that sometime during 2014 double-deckers will return to the 35 bus route and the TravelRight History By 35 Bus Day from Bulwell on 24 May 2014 will be a double-decker (to pre-book a ticket, contact TravelRight). From this point on the Derby Road there are also visible remains of the Nottingham Canal and the River Leen. Close by are the Jelley Homes and Woodsend Memorial Homes and The Rose & Crown public house. 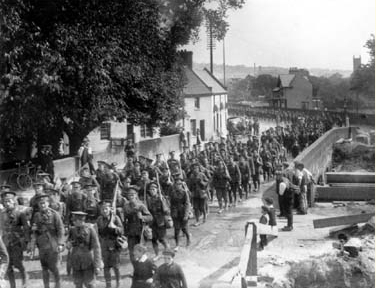 The photograph above shows soldiers the Sherwood Foresters Regiment in 1914 crossing Nottingham Canal, with the original Rose & Crown to the centre of the photograph. The Lenton Times website has information about all these places, including Hillside itself. 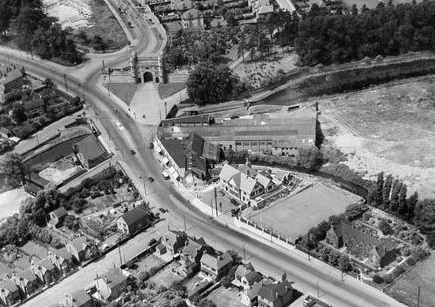 For more information about the historic significance of Hillside, visit the Derby Road page on the Lenton Times website. I took this photograph of Beeston Lodge, the south entrance to Wollaton Park, on Derby Road in 2008. Its facia is this dirty colour and is very different to Lenton Lodge, but was built at the same time as the long high wall along the Derby Road, when the Middleton family, who then owned the estate, feared a popular uprising and wanted to protect the estate as best they could. 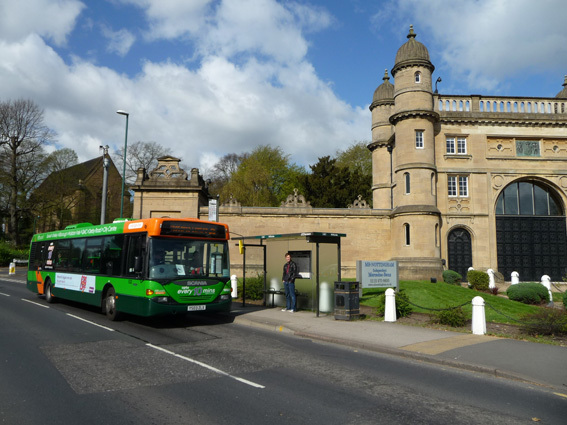 Every bus stop in Nottingham is a history bus stop, but few have as many historic landmarks as the 35 and the other bus routes which travel along the Derby Road at this point. FOOTNOTE POSTED 8 MAY 2014: Found this wonderful aerial view of Hillside in 1937 on the English Heritage website. Click this link for more information. I have finished work today on a large map which, I hope, will be reproduced as part of a A3 leaflet promoting Nottingham City Transport’s route 35 as a ‘History Bus Route’. The word ‘Heritage’ comes to mind every time I write the phrase. ‘Heritage’ or ‘History’? I used to think of heritage as being what we could see and history was what we read. What do you think. History or Heritage?